Chic Hair Ja. & Salon specializes in providing quality virgin hair extensions. Chic Hair Ja. & Salon caters to women of all ethnicities through the various extension lines and services offered at the company. Chic Hair Ja. was established in 2012 in an attempt to satisfy the needs of the everyday woman. Premium virgin hair over the years has been difficult to source; bearing this in mind Chic Hair Ja. has taken the initiative to meet the demand. We have sourced our virgin hair from South America and South East Asia (Brazil, Cambodia, India, Malaysia and Peru). Women of these origins pride themselves in maintaining healthy hair through the consumption of natural herbs (to ensure durability and strength is upheld. 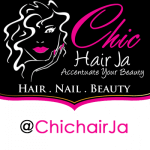 Chic Hair Ja.’s virgin hair extensions are unmatched in terms of consistency and quality. Our virgin hair has the finest unidirectional cuticle layers (from root to top). This ensures that we provide hair that matches your natural hair and behaves in a likewise manner. As women, we desire full, luminous and durable hair. Virgin hair purchased at Chic Hair Ja. can be re-used and last more than a year. Chic Hair Ja. & Salon was complimented with a full service salon in January 2014. The salon also caters to women off all ethnicities. Our services include relaxing, cutting, treating, manicure, pedicure, deep penetrating therapy, gel polish etc. The atmosphere at Chic Hair Ja. is an exception compared to the others from the quality customer service to the complimentary services (wi-fi, beverage, air condition, cable television, radio, massage chairs, etc.) offered.